MarvinSketch assigns 'M' and 'P' stereodescriptors to biaryl structures with at least 3 ortho substituents. Atropisomers should always be drawn with solid wedged and hashed wedged bonds within the aromatic rings and directly connected to the single bonds about which they rotate. One ring system of each pair should be drawn exclusively with plain bonds. The other ring can be drawn with two solid wedged bonds, one directly connected to the rotating bond and one opposite. In even-membered systems, the bond between the solid wedged bonds should be depicted as bold and unwedged if it does not itself participate in a ring fusion. 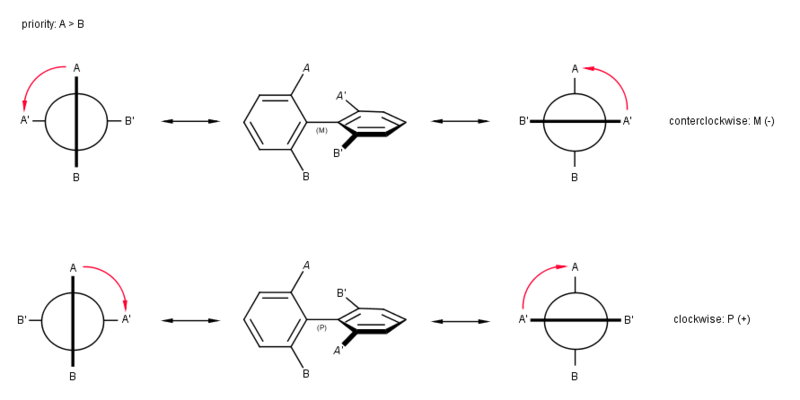 It is acceptable to depict the aryl systems with only a single wedged bond, as long as it remains directly connected to the single bond about which the aryl system rotates. MarvinSketch assigns M/P stereolabels exclusively to biaryl compounds having at least 3 (2+1) ortho substituents. However, in many other structures atropisomerism can be observed. 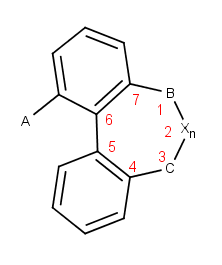 bridged biaryl compounds where the ring involving the two substituents is less then 8 membered i.e Cecropin. Dimension changing ( i.e. 3D/3D cleaning) does not preserve atropisomerism. If two stereoactive atoms (atoms with at least three different ligands) are connected by an even numbered chain of rigid parts then axial stereo information can be defined on the ligands of the stereactive atoms. These ligands are the ones which are not in the chain of the rigid part. You may find more information concerning stereochemistry in the query guide or in the developer guide.